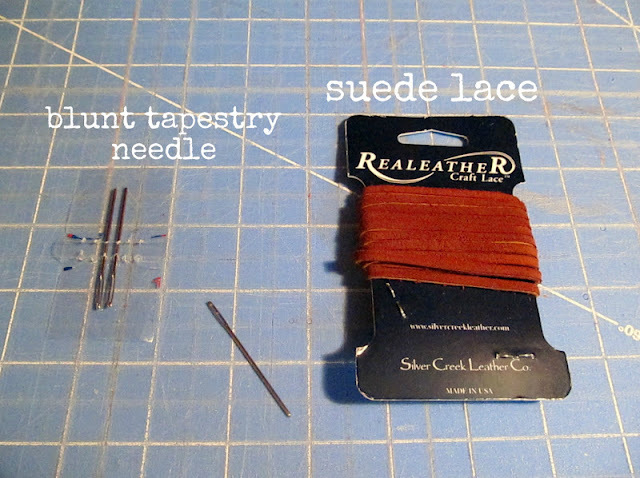 So...the very first crafting tutorial here at Sew Technicolor! I have to admit that I was incredibly intimidated about doing this. And now that it's finished, I have a whole new respect for bloggers who write tutorials all the time. It's a lot of work! But it was definitely an interesting process and I'm excited to share it with you guys. :) I'm also linking up to Think Pink Sundays at Flamingo Toes. Just remember that this is my first experience with writing and photographing a tutorial, so bear with me through the rough spots. I also realized that while my crafting area has plenty of light for actual crafting, it has terrible lighting for taking photos. I apologize in advance for any dark photos or glares from my lamp! This is part one of a three part tutorial: part 2 and part 3. These particular instructions are for the faux leather journal shown above. The journal measures 7 x 9 inches closed, and the pages inside measure 6 x 8.5 inches. This is my favorite size for a journal. This book is perfect for travel or for recording all of your lovely summer adventures. 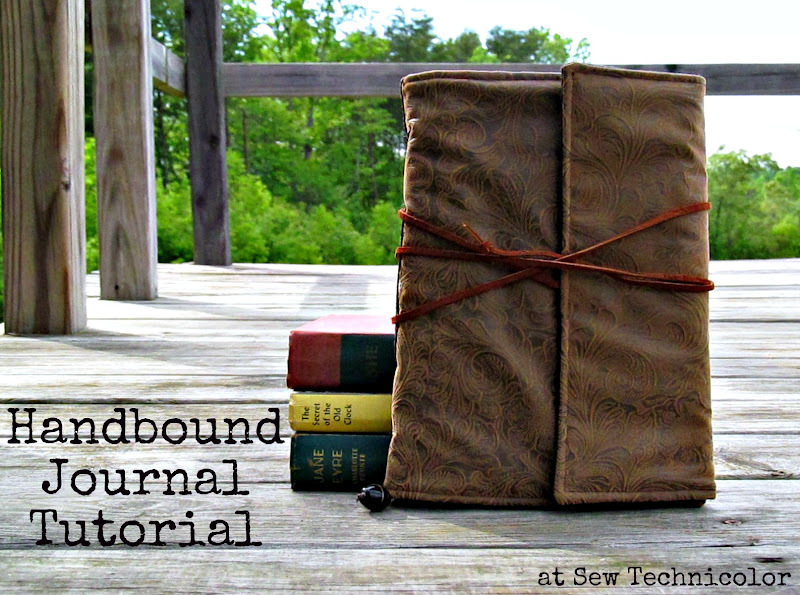 :) At the end I'll include adjustments for making this journal in fabric or real leather instead of faux leather. As for paper, you can use pretty much any kind, depending on what you need in a journal. I've used cardstock before. 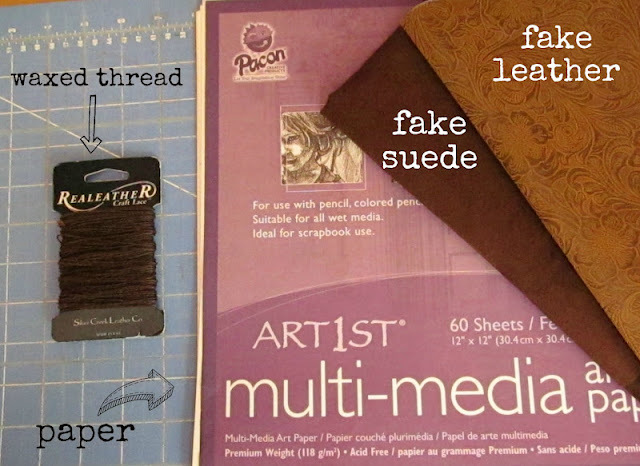 Now I always use this multi-media art paper, and I've found it to work really well for how I use my journal: writing, gluing stuff in, etc. The only kind of paint I've tried on it so far is watercolors, and it did wrinkle a bit (but I guess all paper does except watercolor paper). You can even mix in different kinds of paper...I want to try that soon. For this journal, 12x12 paper works best. In case you're wondering, a bone folder is a tool that helps you get nice, smooth creases and folds with your paper. It's called a "bone" folder because most nice ones are made from bone. Mine came from Hobby Lobby and is plastic, but it's worked well for me. You'll need some way to punch holes through paper and the faux leather. I used to use an awl, which works okay. Sometimes it's a bit hard to work through thick pieces and it doesn't always make holes the same size. I highly recommend getting one of the hole puncher sets shown below. It comes with three or four different sizes that you can interchange, and you hit it with a hammer to punch the holes. It's so much easier. You can use it for all sorts of things! I used the 1/16" size for this journal. Okay, so the first thing we're going to do is make the inside of the journal. I want to mention one little thing...did you know that paper has a grain, just like fabric? (Most paper. I think there's some that doesn't- maybe handmade paper?) 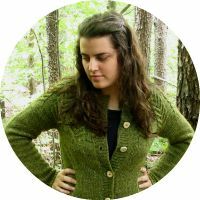 When I first learned that, I thought that it was just something that finicky bookbinders might care about. But it honestly does make a difference. To find out which way the grain of your paper runs, just gently bend it in half (don't fold it- just act like you're going to). Then bend it in half the other way. It will bend easily one way and have more resistance the other way. Does that make sense? The way that bends easily is the grain and the way that you want to fold it when you're making pages. To show you the difference: the top paper below was folded along the grain. The bottom was fold against the grain- see how wrinkled and rough it is? Paper folded against the grain is weaker and also much more likely to tear when you don't want it to. You'll need thirty sheets of 12x12 paper (if you don't have quite that many, that's fine. I only had 26, which just means that I had a few less pages in the book). 1. Take your 30 sheets and trim them down to 8.5 x 12 inches. If you lay the paper the way I did below, with the grain line (the way it folds easily) running vertically, you'll just have to trim 3.5 inches from the bottom. P.S. Save the paper you trim- you can use it to make small books. If you're using a rotary cutter and ruler, you can trim up to five or six pages at a time. 2. 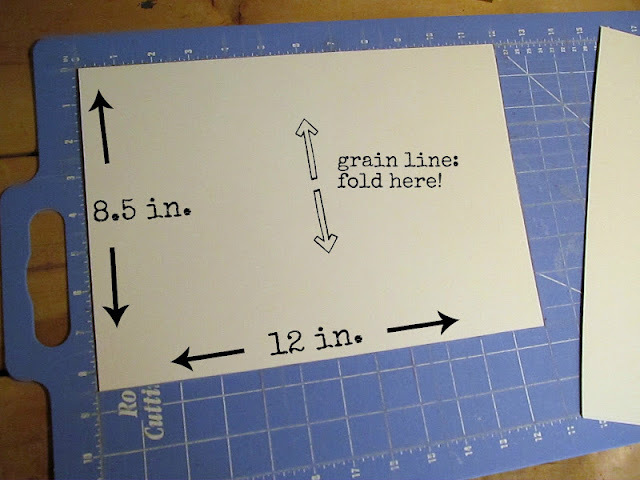 Using a bone folder (you could probably use a butter knife or something similar), fold each piece of paper in half along the grainline. So the folded piece will measure 8.5 x 6 inches. By the way, you'll notice that the pages aren't even on the end. Some of the edges stick out more than others. If you don't like that, you can trim up the edges to be even. 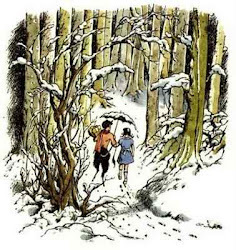 I personally love it, because it makes things look handmade (plus it reminds me of the Series of Unfortunate Events books). Put the signatures aside for now. 4. Cut a scrap of cardstock (or other sturdy paper) into a rectangle measuring 1.5 x 8.5 inches. This is going to be the template for punching holes in the spine. Using a pencil and a ruler, mark the spots for the holes. Start by marking six spots on each short end, 1 inch in from the edge. The six marks should be 1/4 inch apart, with the first and last ones being 1/8 inch from the edge of the cardstock (see below). Then come in 1.5 inches from those markings (2.5 inches from each short end) and do the same thing: six markings, 1/4 inch apart. 5. 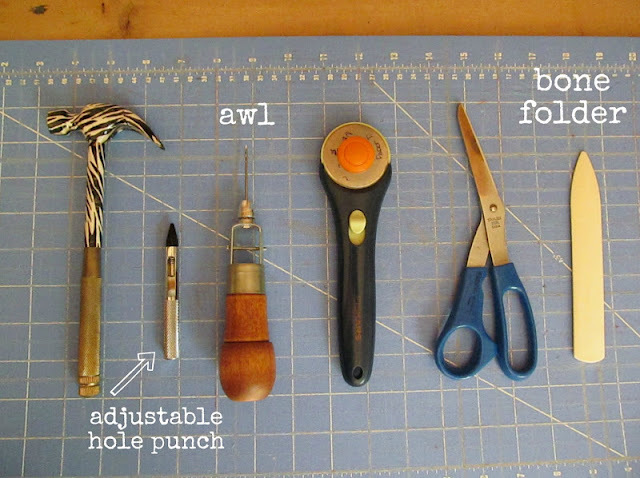 Using the hole punch or awl, make a hole at each dot. The hole needs to be as small as possible- just big enough for a tapestry needle and some waxed thread to fit through. I used the 1/16 inch hole punch. You'll end up with something like this. After this project, keep the template, because you can use it on any other books you make that are this size. 6. Take a signature and make sure it's aligned. Lay it open, keeping your fingers at the crease to make sure everything stays aligned. Lay the template down, with the far left holes at the crease of the signature. Check the top and the bottom to make sure that it's straight. Mark the four holes with a pen or pencil. 7. Punch holes at each of the four markings at the crease. Repeat steps 6 and 7 with all six signatures. That's all for the pages now! Next we're going to work on making the outside of the journal.